I frequently read the food section of www.mysa.com, and I was thrilled to see the headline “S.A. gets raves for its breakfasts,” because so far, my experience with breakfasts in SA has been less than stellar. 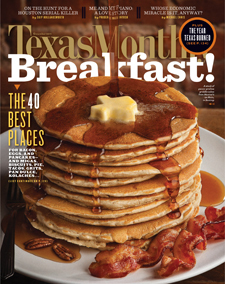 Texas Monthly compiled a list of the 40 best breakfast places in all of Texas and a bunch in San Antonio received kudos? Woohoo!